Every year, millions of babies around the world die within the first 4 weeks/28 days of life. According to the World Health Organization, 45% of all under-5 child deaths in 2017 were newborn infants1, most of whom lacked access to skilled neonatal care. What set of skills are required to provide effective and life-saving neonatal medical care? And, if the infant patient's condition is one that is seldom encountered (either because it's such a rare occurrence or learners haven't yet received the practical training), how can healthcare professionals develop the knowledge they need to do what is necessary to save a baby’s life in a critical situation? Decisions made during the first fragile days and weeks following birth can carry life-long implications for both the newborn baby and mother. Therefore, obtaining suitable practice within realistic and risk-free environments is crucial for healthcare teams to strengthen the thinking, technical, and communication skills they need to improve patient outcomes. Whether employing critical interventions (administering CPR; managing catheter placements) or conducting routine care procedures (assessing the patient; drawing blood), medical personnel require training in a variety of scenarios in order to consistently perform at their best. CAE Healthcare’s first tetherless and completely wireless infant simulator, CAE Luna, is perfect for in-situ, team-based simulation training. This scalable baby simulator comes in three patient configurations to offer a wide range of options in neonatal training. Remarkably lightweight and realistic, CAE Luna represents an infant from newborn status to 28 days after delivery -- a period when they are at their most vulnerable and susceptible to extreme health crises -- allowing for high-level practice in crucial healthcare for babies. From ventilation and intubation to post-resuscitation stabilization of a neonate, CAE Luna effectively facilitates progressive clinical skills development while satisfying requirements for Infant Nursing Skills, Pediatric Advanced Life Support (PALS), and the Neonatal Resuscitation Program (NRP). Simulation-based training in neonatal care is viewed favorably by many health professionals who are not only experienced in the medical care of newborns and infants but who also understand how very important it is for healthcare teams to feel confident in the training they receive. With efficacious simulation training, healthcare personnel can prepare for the unexpected, develop procedural confidence, and become more able to respond with behaviors that can save lives. 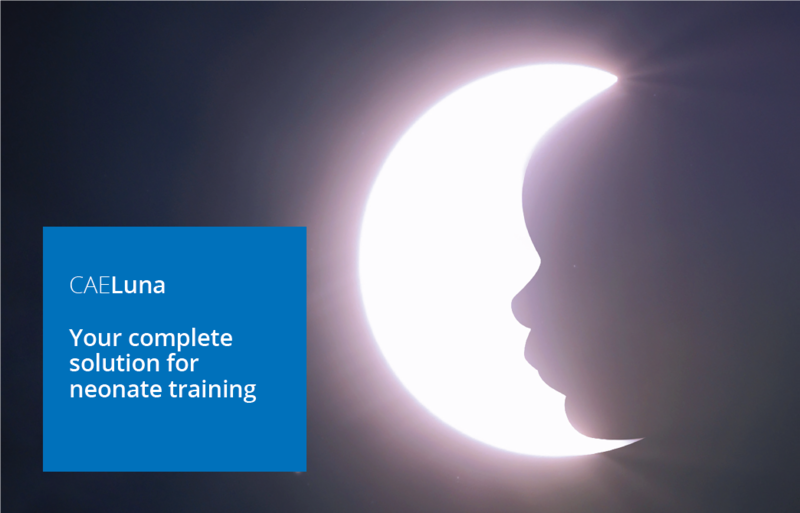 For training that exceeds your expectations, look to CAE Luna, an advanced infant baby patient simulator that's uniquely designed to address a comprehensive range of neonatal healthcare training needs.